The table of contents below shows the topics related to the fundamental aspects of rhythm. If you are looking for a specific answer, jump to the appropriate link. If you don’t know where to begin, start with the first section and avoid skipping steps. 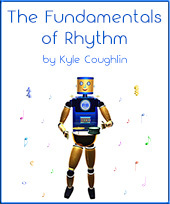 Each lesson page includes an introduction to the topic and links to practice suggestions and the practice patterns in Kyle Coughlin’s book, The Fundamentals of Rhythm. If you would like all of this information in book format so that you can put it on your music stand and practice it wherever you go, get The Fundamentals of Rhythm, by Kyle Coughlin. The book includes all of the lesson information and practice exercises found on the website. 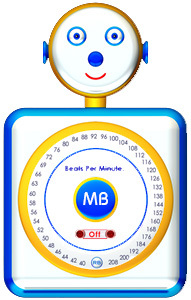 Use MetronomeBot for a fun online metronome! The online metronome that counts the beat, subdivides, and offers encouraging practice tips.